I find the Entertainment/Fashion and Beauty industry are intertwined, but with the growth of Myspace, Facebook and Twitter celebrities seem to have the finger on the pulse that everyone wants to know what they're doing and well are interested in what they are thinking. Which is why I bring you GOOP!!! Goop is the brain child and musings of Ms. Gwenyth Paltrow, in a Newsletter format; you can read and catch up on things that she finds interesting, riveting and must haves! Learn about her trainer, her food, and even where she likes to go. Read the trend, wonder how long this will last??? Why are people so afraid of Colour??? 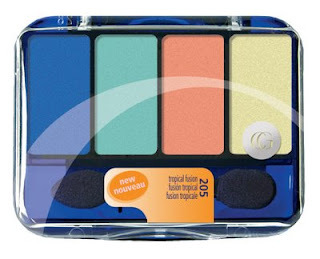 I have had the privilege of receiving a very FUNTASTIC eyeshadow quad from Cover Girl called Tropical Fusion. When you first set your eyes on this case it might be a smidge jarring, but let me tell you this is the best little bundle of fun and colour that anyone who lives North of the Equator could use to spruce up their ever boring WINTER!! This colour combo takes any one's make up case from Drab to Fab, this little popular makeup quad even has it's own Webtutorials... for every type of colour combo to make you reminisce of fun times on the beach, sipping your Bahama Mama while enjoying Caribbean dancing and Soca playing drums. Get your hands on this one before you can't find it, you'll thank me.... it's the best bang of 4 colours you'll get for you buck. Work it with your Winter Blacks and Whites, it really will make a night out on the town memorable. I know I'll be wearing it this Weekend!! !